INCHEON, South Korea – The eight-nation baseball competition at the 17th Asian Games opened with three contests today (Monday), including a five-inning 15-0 victory for host S. Korea over Thailand, which helped fill the 27,600-capacity Munhak Baseball Stadium. 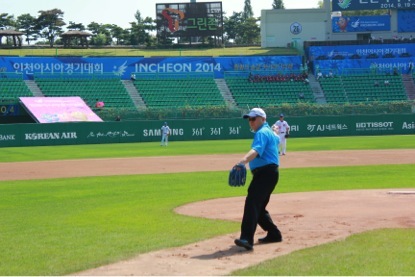 The XVII “Asiad” officially opened on Friday, 19 September in Incheon, South Korea – where baseball is considered the national sport and where top professional baseball league -- Korea Baseball Organization (WBSC/IBAF Associate Member) – annually attracts more than 7 million fans to the stadiums, putting KBO among the top attended sports leagues in the world. In the first day of competition, Chinese Taipei cruised past Hong Kong, with a 12-0 victory in seven innings. Japan also registered a seven-inning shutout victory, 11-0, over China. In line with IBAF rules, international contests end before the regulation 9 innings if a team is leading by more than 15 runs after the 5th inning or by 10 runs after the 7th inning. After an initial round-robin in group play, the top two seeds from each group will qualify for the semifinals, with the group winner facing the runner-up from the other group. Chinese Taipei, Japan and South Korea – ranked Nos. 1-3 in Asia – are the favorites to medal. South Korea is the defending Asiad baseball champion and possesses a star-studded 24-man roster in Incheon that features 23 players/national heroes from KBO. In a much anticipated contest, Chinese Taipei and South Korea will clash in a highly important preliminary match-up on Wednesday at 18:30 (local time) before a sold-out Munhak Baseball Stadium. The loser will likely have to face Asia’s top team and world No.2, Japan, in the semifinals on Saturday to advance to the gold medal match. South Korea manager, legend Ryu Joong-il, made a bold prediction in a press conference last week: “We promise to go undefeated in all five games”. 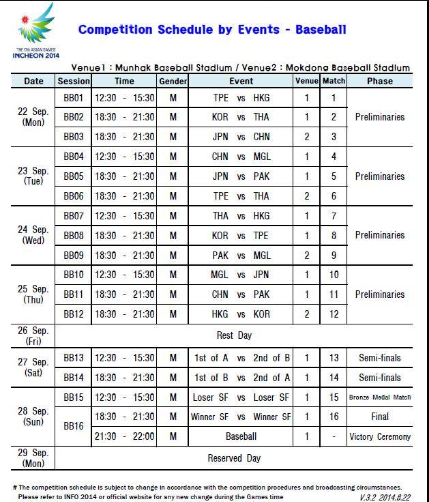 It is the sixth edition in which baseball is being featured at the Asian Games, after successfully debuting at the 1994 Asiad in Hiroshima, Japan, which followed softball’s entry to the pinnacle multi-sport event in Asia in 1990 in Beijing. South Korea has won the Asiad three times, while Chinese Taipei and Japan have won it once. Asia’s top three nations have not shared the medals with other nations; China has finished fourth at all Asiads, just narrowly missing the bronze by a matter of a few runs.